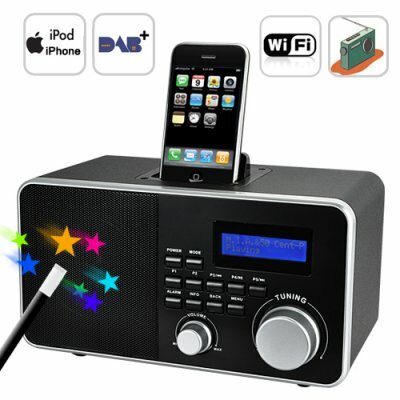 Successfully Added Super Radio (Streaming Internet, DAB+, iPod/iPhone Dock) to your Shopping Cart. It's a DAB+ radio! It's an Internet radio! It's a iPhone docking station! It's a ... Super Radio! All that power from one device, is it possible? Yes, the E63 Super Radio gives you all the most popular 21st century entertainment options, and comes with a classic radio style housing and interface that is easy for everyone to use. Why are digital radio receivers so cool? Because DAB+ receivers (like this one) are able to receive both DAB and DAB+ radio broadcasts which means with Super Radio you'll be able to enjoy all the news, music, and talk shows you crave...in your own language! Internet Radio: Streaming internet radio...is there anything better? Whether your audio pleasure is Shoutcast, Live365, SomaFM, DI.FM, LastFM, Pandora, etc...this baby will let you listen to your favorite internet radio station. How does it do that? The Super Radio has a built-in WIFI receiver to let you get on the Web that's how! You'll be able to access the hottest music, news, and podcasts the Internet has to offer. iPod/iPhone Dock: Chances are, if you're into digital music, you own a iPod or iPhone. Perfect! The Super Radio is a first class docking station for most generations of the Apple iPod and iPhone. That means you can keep your Apple device charged as well as play your entire music collection through the Super Radio's HIFI stereo speakers. You can even use The Super Radio as a speakerphone. Amazing? No, The Super Radio is super amazing! Elegant and durable, you're going to make a lot of profits reselling The Super Radio in your physical or online store. Add to cart right away before stock runs out! Order today and we'll ship it out within 24-hours! Another innovative electronic device from the leaders in online direct from China awesomeness - Chinavasion. DAB+ vs DAB receivers: DAB+ receivers are superior over DAB receivers because of the improved transmission method and error correction. Also DAB+ is backward compatible. Perfect for the home. Perfect if you own a bar or restaurant. Perfect for the office. Order today, we'll express ship it tomorrow! So to use internet radio, I basically type a URL into The Super Radio? No it's easier than that. Register all your favorite radio and podcast stations at wifiradio-frontier.com. The Super Radio wirelessly connects with wifiradio-frontier portal server, and allows you to choose and listen to whatever internet streaming radio stations you have listed there. What about the readability of the user manual? It's especially good. Perfectly written English. Good grammar. Clear instructions with diagrams. Copywriters were brought in for this project. If you're using it yourself, you'll love it. If you're reselling it, your customers won't have a problem with the setup or bother you with questions. Plus The Super Radio is pretty intuitive to use anyway. Any good Internet radio stations you can recommend? We like most radio stations on shoutcast.com, Live365.com, di.fm, sky.fm. Soma.fm is especially cool if you're into eclectic. Enjoy. Does this product work with my iPhone 3GS? We tested the unit in our office with a normal 2G iPhone and it docked fine. Our opinion is that it probably won't work with an iPhone 3G or 3GS. Unfortunately the audio quality is quite bad, especially at high volume there is very noticeable audio distortion. The DAB and FM sensitivity is also quite low. Although I can tune to most radio on other receivers, I cannot get a DAB signal with Super Radio, and FM is very weak/noisy. Great features DAB+, Internet Streming.Easy to setup no manual needed.Wonderful Radio I recommend it. Good quality radio. more then 15000 wifi radio stations on wififrontier. You can setup your own wifi radio favorites. dab+ is works well. Easy to setup in minutes. Streaming music from other device on your network works well. Great in a kitchen or living room or anywhere else. Clearly one of the best item i've ordered on chinavasion. Much more expensive when i buy in local shop other similar item. Got the product in 3 days in very good condition. My order was finalised on Saturday morning and it arrived in Australia the following Monday! Incredible service and the product is totally up to my expectations !! Would thoroughly recommend this radio to everyone looking for a digital radio with internet streaming facility.